In a luscious cooking class I took last night with my moms, I made an amazing discovery. 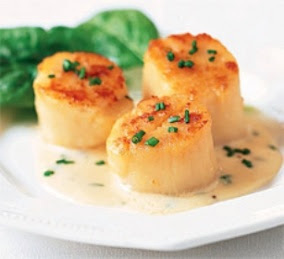 I LOVE SCALLOPS! I never knew because I've never had one. My dining out experiences are about to get a lot more exciting and ...scallopy. Also, you should peep Parenthood, the new show on NBC. I think this one is going to be a keeper! I thought this was "Diva Says What" blog, not "Diva Says Scallops" blog!